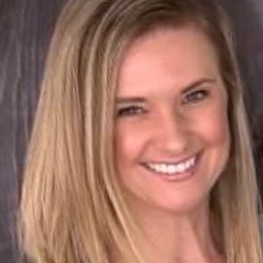 Heather Fisher is a literacy coach in Hudson, Massachusetts. "We don't have enough leveled texts!" is the cry from teachers. 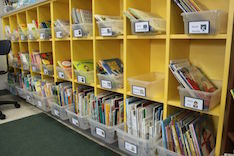 Heather Fisher helps them move beyond the school book room to more creative online resources to meet students' needs, and move beyond narrow definitions of text suitability. 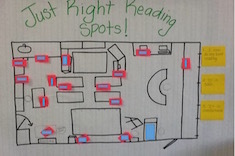 If children can choose just-right reading spots, they will have more stamina for reading. Heather Fisher explains how she works with first-grade teachers and students to build this skill. 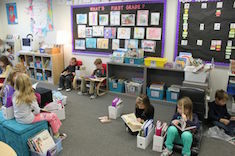 Heather Fisher works with first graders to teach them the strategy of taking “mini-breaks” to sustain reading during workshops. This video is a quick take from Katie DiCesare’s first-grade classroom, showing how she uses the tune “Come On Over” as a transition tool.